We had 8 beautiful EVs with knowledgeable owners on hand to answer questions, including one from Power Kia in Salem. The dealer rep indicated the event was totally worth their time and was very enthusiastic about the response to the Soul EV. 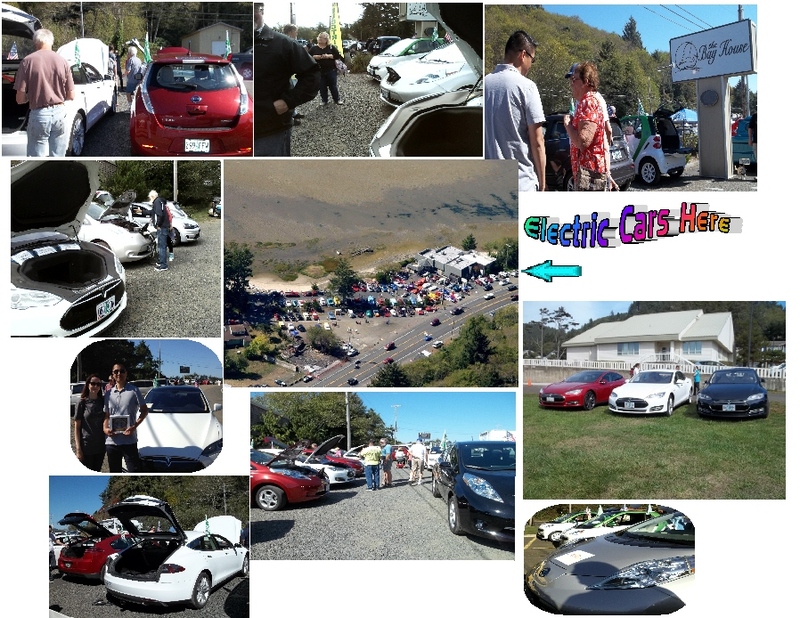 Many more car show participants lingered in the EV area this year, although most were shy about actually driving a car. One couple from Los Angeles, previous NDEW event organizers, dropped by on their travels. Dave's bright yellow Tesla Roadster won one of the awards for the car show and it was nice the EV group got some recognition. 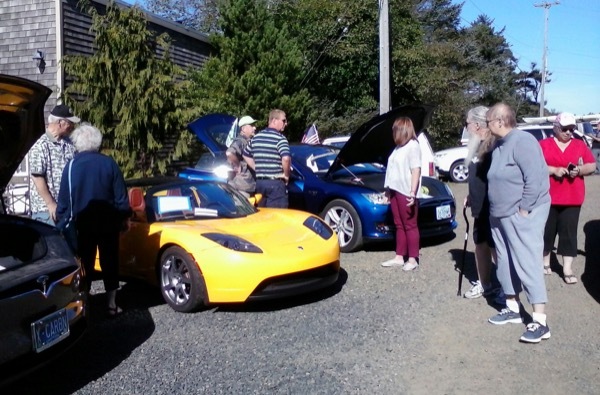 Many thanks to Cruisin' the Bay Car Show for again allowing us space to display the EVs and to Oregon Beach Vacations for covering registration fees and driver gifts. Oregon Beach Vacations, Oregon Electric Vehicle Association, and Central Lincoln PUD also contributed to the Cruisin' general fund to help with the show. Each year gets better and there was clearly more excitement this year about electric cars. Dan Gleason (green cap) talks to show participants about his Tesla Model S 70-D. If you drive north, check out Seaside supercharger. There's the cheese factory in Tillamook but also Blue Heron is a pleasant stop with a cafe, interesting cheese and foods store, animals to feed, and a Tesla destination charger. Welcome to our National Drive Electric Week celebration which is again part of the Cruisin’ the Bay Car Show on the Siletz Bay. We thank Cruisin’ the Bay for their generous and continuing support of our NDEW event and for providing space to showcase electric vehicles. We also welcome support from Oregon Beach Vacations--a company that whole-heartedly embraces EVs and walks the talk with several EV owners on their team. Several models of electric vehicles will be on display with enthusiastic and well-informed owners on hand to answer questions about their cars. We will have on display the Nissan LEAF, Tesla Model X, Tesla Model S, Smart for two Electric Drive, Kia Soul EV, Mercedes B-class, and hopefully a few more. We’ll also have the ever-popular ride and drives where attendees can drive an EV. To date, this includes the Nissan LEAF, Kia Soul EV, and Tesla Model S.
EV owners please register to attend. Display cars and ride and drives must be present from 9:00 a.m. to 3:00 p.m. We’ll accommodate as many as we can in the limited display space but showcasing as many different EV models as possible will be top priority. Car show entry fees will be sponsored for our display and ride and drive cars with paperwork to fill out on site to enter your car for judging. We encourage other EV owners to attend even if you can't stay all day. Please register, indicate in your comments that you are “dropping by," and add your electric miles driven to our grand total. Let’s see how many all-electric miles we can build up! Parking is available along Hwy. 101 and in the neighborhood surrounding the car show. Are you considering going electric for your personal or business needs? Come talk to owners who have successfully done so. Take an EV for a test drive! Registered attendees report 295,073 electric miles driven.